Excavations underway at Coontail Spin Cave in 1962. Access to this cave was extremely challenging because of its remote location. Archeologists reached it by descending a long, steep slope from the opposite canyon wall and then climbing up a narrow tortuous path to the cave. Photo from ANRA-NPS Archives at TARL. 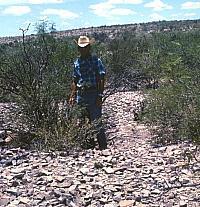 An unidentified man stands in center of a ring midden, a roasting pit where lechuguilla and sotol were baked in earth ovens using hot rocks. Such places were used over and over resulting in a donut-shaped ring of spent cooking rocks. Ring middens are very common in the Lower Pecos Canyonlands. Photo from ANRA-NPS Archives at TARL. Archeologist Dave Dibble looks up from the bottom of the deepest excavation pit at Arenosa Shelter. This photo was taken in 1968 while soil sampling was underway. 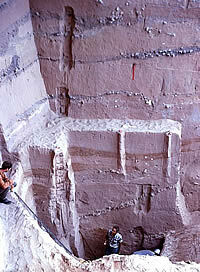 The narrow, vertical gouged-out areas in the profiles are places were samples and special sediment "monoliths" (intact columns) were removed. Photo by E. Mott Davis, TARL archives. 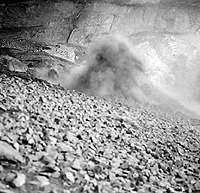 Excavation crew working in suffocating dust of Fate Bell Shelter in 1932. This problem has been faced by all excavators. The modern practice of sifting (screening) the soil has only made things worse. Dust churned up by the 1932 work and subsequent uncontrolled digging still adheres to the wall of the shelter and obscures the once-plain pictographs. Photo from TARL Archives. Arenosa Shelter under excavation. Photo from ANRA-NPS Archives at TARL. 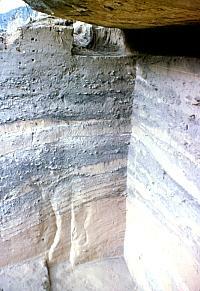 Close up of upper deposits at Arenosa. 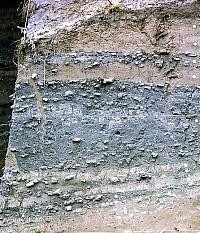 The thick gray layers are periods during which human occupation was intense (and when floods were few). Most of the occupational materials are the result of earth oven cookingfire-cracked rocks and charcoal- and ash-stained soil. Photo from ANRA-NPS Archives at TARL. The deep deposits at Arenosa Shelter alternated between dark, gray cultural deposits and lighter, tan flood deposits. Photo from ANRA-NPS Archives at TARL. The Lower Pecos Canyonlands, with its remarkable concentration of rockshelters and polychrome rock paintings, offers unique opportunities to study how hunter-gatherers adapted to a semi-arid environment. The archeology of the region provides one of the best preserved and longest records of hunter-gatherer lifeways in North America. Since the economy of hunter-gatherer groups is closely tied to the land on which they make a living, the archeological remains should closely reflect the nature of the environment. For example, much of the debris recovered from midden deposits within some rockshelters and in many open campsites is associated with the use of earth ovens to cook agave, sotol, yucca, and other root foods. The images painted on the canyon and cave walls reflect a belief system very closely tied to plants and animals characteristic of the region. Archeological research in the region began in the early 1930's with excavations sponsored by the Witte Museum of San Antonio, the Smithsonian Institution, and the University of Texas at Austin. The most extensive investigations included work at Fate Bell Shelter by A.T. Jackson of the University of Texas, the Witte Museum excavations of Shumla Caves, and digs at Goat and Moorehead Caves for the Smithsonian. During this time, A.T. Jackson and Forrest Kirkland began documenting the remarkable rock paintings of the region. The next great push in research was triggered by the construction of Amistad Reservoir near the confluence of the Pecos and Devils Rivers with the Rio Grande. The National Park Service established the Archeological Salvage Program field office, which was later placed under the control of the University of Texas and renamed the Texas Archeological Salvage Project. Survey, testing, and several large-scale excavation projects were carried out beginning in the late 1950s and continuing through the mid-1960s. 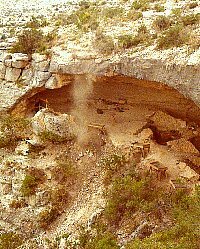 Numerous rockshelters were partially excavated including Bonfire Shelter, Centipede Cave, Conejo Shelter, Coontail Spin Cave, Damp Cave, Eagle Cave, and Parida Cave. Two deeply stratified sites located on river terraces were also investigated, Arenosa Shelter near the confluence of the Pecos River and the Rio Grande, and the Devils Mouth Site at the confluence of the Devils River and the Rio Grande. 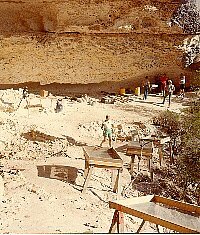 After the completion of the Amistad Reservoir salvage project, extensive excavations were conducted in the 1970s at Hinds Cave by Texas A&M University and at Baker Cave by the University of Texas at San Antonio (the latter continuing into the early 1980s). Both of these rockshelters proved to have dry deposits rich in perishable material remains as well as deep deposits with evidence of occupations going back 10,000 years or more. 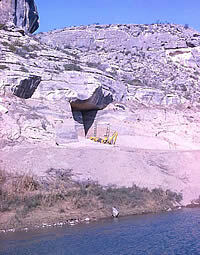 Beginning in the mid 1970s, the State of Texas acquired Fate Bell Shelter and surrounding properties and established Seminole Canyon State Historical Park. Prior to the opening of the park, research included a survey of archeological resources and the excavation of Seminole Sink, a prehistoric cemetery in a sinkhole cave. 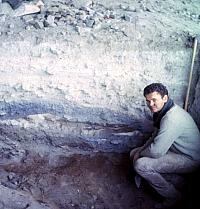 In 1984, additional excavations were carried out at Bonfire Shelter. 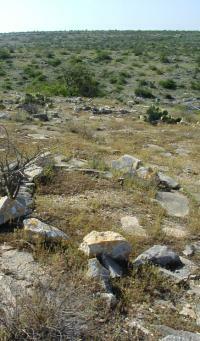 Since the 1980s, no major excavations have been undertaken in the Lower Pecos. Research into the rock paintings of the region has been fairly active over the last three decades. Solveig Turpin was the first archeologist to examine the role of rock art in the foraging societies of the region. She refined the definitions of the rock art styles, and began to tie the images depicted in the paintings to both ritual and subsistence activities. Carolyn Boyd continued to refine methods in the study of rock paintings and devised an interdisciplinary approach to rock art research and interpretation. She also maintains that many of the rock paintings constitute pre-planned panels, the product of an individual artisan. Although rockshelters and caves have been the focus of most archeological investigation in the Lower Pecos Canyonlands, there are many other kinds of sites, few of which have been studied in detail. The site types can be divided into two general categories, sheltered and open. (See Rockshelters and Rock Art sections for discussion of the sheltered sites.) Open sites include burned rock middens, bedrock mortar holes, rock alignments, ceramic scatters, and terrace sites along the major streams and rivers. Terrace Sites: Although most open sites in the region are shallow, there are deep, well-layered sites on the floodplains (alluvial terraces), particularly where major streams come together and where side canyons enter major streams. Unfortunately, a great many of the deepest and most important terrace sites were inundated by Amistad Reservoir and were never studied. Lithic Quarries: Quarry or "lithic procurement" sites are places where outcrops of flint (chert) occur, either eroding from the limestone bedrock or as ancient gravel deposits left tens of thousands of years ago by ancient rivers. Prehistoric peoples made extensive use of flint rocks, so much so that chipping debris can often be found scattered over wide areas. Archeologists sometimes have difficulty in deciding how to document quarry sites simply because they can be very large and rarely have neat boundaries. They are also problematic because most of the chipping debris cannot be datedmany quarries were likely visited over and over by hunter-gatherers over thousands of years. Hearth Fields and Middens: Perhaps the most abundant and permanent evidence of human occupation in the Lower Pecos Canyonlands is that left by the practice of using heated or hot-rock cooking techniques. Archeologically, the sites with abundant evidence of hot-rock cooking are called hearth fields, ring middens, and burned rock middens. They can occur on stream (alluvial) terraces, on hill slope (colluvial) terraces, or on shallow rocky soils in the uplands. Hearth fields are large areas covered by multiple hearths 1-2 meters (3-7 feet) across that are often located in gently sloping areas overlooking drainages and on upland slopes near canyon headers. Ring middens are donut-shaped piles of fire-cracked limestone rock about 20-30 feet across that formed around a central roasting pit (the hole of the donut). Burned rock middens are more amorphous heaps of fire-cracked limestone rocks left by the same processearth oven cooking (see Economy). 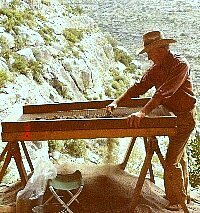 Archeological research in the project area and surrounding regions has defined the broad outlines of the culture history of the Lower Pecos. Excavations at deeply stratified terrace sites and deep rockshelters have yielded long sequences of distinctive projectile points. 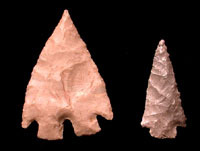 Projectile points are useful as time-markers because point styles changed through time. The two most important sites in this regard are the Devils Mouth site, at the junction of the Devils River and the Rio Grande, and Arenosa Shelter near the junction of the Pecos River and the Rio Grande. Over 250 radiocarbon dates have been obtained from these and other Lower Pecos sites. One of the difficulties in making sense of the radiocarbon dates is that most have come from rockshelters. Rockshelter deposits are often very complex because they have been mixed or churned up over time by common cultural practices such as pit digging and natural processes such as animal burrowing. Animals and humans competed for the use of many rockshelters. The protected overhangs with their soft, ashy cultural deposits and many organic materials offer attractive habitat for rock squirrels, pack rats, gophers, skunks, badgers, and other burrowing and nest-building creatures. As a result, the radiocarbon dates from the rockshelters have often presented problems in interpretationdates that are too young or too old for the artifacts found nearby. 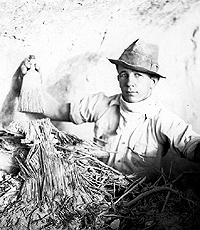 Famous picture of archeological assistant at Fate Bell Shelter, 1932, holding modern whiskbroom above prehistoric fibers. Photo from TARL Archives. Archeologist Mark Parsons in test pit excavation at Fate Bell Shelter. The white layers consist of mostly cave dust and roof spalls and represent periods during which the shelter (or at least this part of it) were not in use. The dark gray zones are mainly cooking debris and the brown layer at the archeologist's feet is a fiber zone where perishable materials are present. Photo from TARL Archives. 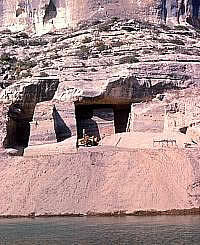 Arenosa Shelter was chosen for excavation because of its location on a low terrace of the Pecos River. 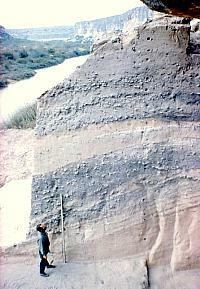 The 1965-1968 hand and mechanical excavations there documented about 50 layers alternating between periods of occupation and major flood deposits. These deposits date back to over 10,000 years ago. Photo from ANRA-NPS Archives at TARL. Mechanical and hand excavations in progress at Arenosa Shelter. Heavy equipment was needed because the deposits were over 40 feet deep. Photo from ANRA-NPS Archives at TARL. A plume of dust rises from Baker Cave, the tell-tale sign of archeologists at work. 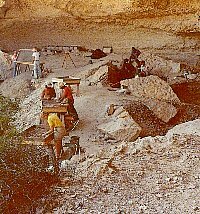 Photo of 1984 work by UT San Antonio archeologists, from TARL archives. A.D. 1000 to 1500 B.C. 11,500 to 12, 500 B.C. 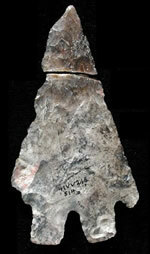 This Plainview dart point from Bonfire Shelter dates to about 12,000 years ago. Baker Cave excavations, 1984. The screens were placed at the edge of the rockshelter in hopes that the updrafting winds would carry the dust away, but at the end of the day, the archeologists were often coated in cave dust. Photo from TARL archives. Pete Saunders found a picturesque spot to sieve for small artifacts from the 1984 excavations at Baker Cave. Photo from TARL archives. Late Archaic dart points from the Lower Pecos. Earthenware pottery sherds from an Infierno phase site. Photo by Steve Black. Tipi or wickiup ring at an Infierno phase site in the Lower Pecos Canyonlands. These sites are situated at prominent points overlooking canyons and are thought to date after A.D. 1500, perhaps representing groups of Plains Indians. Photo by Steve Black. Paleoindian Period (12,500 - 7000 B.C. or 14,500-8500 RCYBP). The earliest human occupations in the region are poorly understood. The bones of extinct Ice-Age animals found in Bone Bed I at Bonfire Shelter are thought to show evidence of butchering, but no stone tools were documented from this level. (See Bonfire Shelter exhibit.) At Cueva Quebrada ("broken cave"), burned Pleistocene mammal bones with butchering marks were recovered in association with 10 chipped stone flakes and a stone adze (Clear Fork tool). Charcoal from the same context as the burned bone yielded dates ranging between 10,500 and 12,500 B.C. (12,000 to 14,300 RCYBP) The connection between these early dates and the tools is tenuous, and very early human occupation (pre-11,500 B.C.) of the Lower Pecos Canyonlands remains to be confirmed. The presence of humans in the Lower Pecos region is well documented by 10,000 B.C. In Bone Bed 2 at Bonfire Shelter, extinct bison bones (possibly Bison antiquus) were recovered along with Folsom and Plainview points. (Several possible Clovis point fragments hint that Bone Bed 2 began forming even earlier.) These animals were stampeded over a cliff into the canyon below. On many of the bones found in the archeological deposits, butchering marks are clearly visible. Bison antiquus bones were also recovered from the middle levels of Cueva Quebrada and the lowest level of Arenosa Shelter, both of which are roughly contemporaneous with Bone Bed 2. Around 9,500 years ago (7500 B.C. ), distinct changes in the lifeways of Paleoindian groups are reflected in artifact changes. Dart point styles became more localized and diverse. Numerous Angostura and Golondrina points, typical of the late Paleoindian period, have been recovered from the Lower Pecos Canyonlands. The large animals of the Pleistocene had become extinct, and the Late Paleoindian economy emphasized smaller game and more plant foods. This is best illustrated by analysis of a well-preserved hearth dating to 7000 B.C. in Baker Cave. The fill of this hearth contained the remains of 16 different kinds of plants, 11 different mammals, 6 fish, and 18 reptiles. This diverse assemblage suggests that the area was already a semiarid savannah with plants that are typical of the modern environment. Early Archaic (7,000 to 4,000 B.C. or 8500-6000 RCYBP). The combination of a semiarid climate, deep canyons, and dry rockshelters has created perfect conditions for the best preserved records of Archaic cultures in North America. The earliest perishable materials in the Lower Pecos date to the latter part of the Early Archaic. Both coiled and plaited basketry and various tool forms including dart points, knives, scrapers, manos, metates, and bedrock mortarshave been documented. 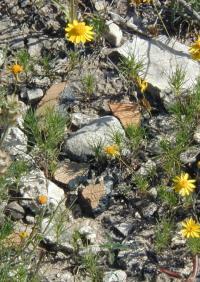 Lechuguilla and yucca fiber was used to make nets, snares, and sandals. The technology of basketry and sandal manufacture is so similar to that documented at sites in northern Mexico that it has been suggested that Lower Pecos groups of the period were closely related to the peoples living to the south and west in Coahuila. During the Early Archaic, rockshelter occupation became widespread in the region. At Hinds Cave in Val Verde County, specialized activity areas were well defined, including a latrine area, a living floor made of prickly-pear pads, grass-lined pits, and oven areas surrounded by burned rock refuse. Dart points characteristic of the period include Early Corner-Notched, Early Stemmed, and Early Barbed, as well as Baker and Bandy point types. Two types of mobile art are known from the Early Archaicpainted pebbles and clay figurines, the latter rare. Painted pebbles are thought to represent human figures, usually feminine. Clay figurines have exaggerated female attributes, but are typically headless. Burial customs during the Early Archaic are poorly known; however, 21 individuals representing all age groups and both sexes were recovered from Seminole Sink, a vertical-shaft cave near Seminole Canyon. Middle Archaic (4000-1500 B.C. or 6000-3000 RCYBP). As populations continued to grow, the people relied more heavily on small animals and a greater variety of plant resources. In the Lower Pecos region, the Pandale dart point is the time marker for the onset of the Middle Archaic. A definitive characteristic of the Early to Middle Archaic is the use of earth ovens for plant baking. 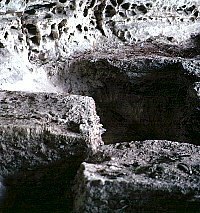 Evidence from Hinds Cave documents the use of earth ovens with rock heating elements to bake lechuguilla (Agave lechuguilla) and sotol (Dasylirion texanum). This appears to indicate a shift to less-desirable plant resources requiring more intensive labor input. By 2000 B.C., the localized Archaic culture of the Lower Pecos Canyonlands was quite distinctive. Population increase is indicated by higher numbers of both "upland" and "lowland" sites. This coincides with the appearance of a complex, polychrome pictographic art form, termed the Pecos River Style, which is also considered a hallmark of the Middle Archaic in the Lower Pecos region. These pictographs depict anthropomorphic (human-like) and animal figures resembling deer, mountain lions, fishes, birds, humans, and many enigmatic figures with both human and animal characteristics. The human-like characters adorned with feathers, wings, and antlers, and holding plants, atlatls, darts, sticks, and pouches are believed to have been associated with shamanic rituals, and have been specifically linked to spiritual transformation of the participants. Recent formal analyses of Pecos River style rock art sites have demonstrated that some represent single panels of work depicting specific types of rituals. Late Archaic (1500 B.C to A.D. 1000 or 3000-1200 RCYBP). The onset of the Late Archaic in the Lower Pecos Canyonlands is marked by the return of bison into the region. This seems to coincide with a wet period as indicated by increases in pine and grass pollen. The most spectacular archeological example is Bone Bed 3 at Bonfire Shelter, which contained the bones of an estimated 800 modern bison (Bison bison). Bison bones have been identified at other sites in the region including Eagle Cave, Arenosa Shelter, Castle Canyon, and Skyline Shelter. The environment of the period has been interpreted as cooler and wetter, promoting the growth of grasslands which allowed bison to return to the region. Some have suggested that plains hunting groups may have migrated into the area following the buffalo and may be responsible for the Red Linear rock art style. During the final millennium of the Late Archaic, the climate apparently returned to a more arid condition, as is implied by a decrease in grass and tree pollen and by the disappearance of bison from archeological deposits. The Flanders subperiod is marked by presence of the Shumla point type. Turpin maintains that people from the plains of Coahuila and the surrounding mountains moved into the lower Pecos River region following the withdrawal of bison hunters. The presence of numerous burned rock middens both inside and outside rockshelters suggests that the Late Archaic was a period of intensive plant baking. An analysis of plant materials from the refuse of a roasting pit in Hinds Cave identified 35 plant species. Although the heated rock was primarily used to bake sotol and lechuguilla, other very important plant resources recovered from the midden context included prickly pear (tunas and nodes) and mesquite (beans and seeds). Late Prehistoric/Protohistoric (A.D 1000 to 1500 or 1300-500 RCYBP). This final prehistoric period is marked by the appearance of arrow points and the use of the bow and arrow. In the Lower Pecos, the earliest appearance of arrow points occurs around 650 B.C (1380 RCYBP) at Arenosa Shelter. Many well-excavated sites in the region do not contain Late Prehistoric deposits, either due to changes in settlement patterns or to destruction of upper deposits by artifact hunters. Point types typical of the period include a variety of arrow points including Scallorn, Perdiz, Livermore, and Toyah . The apparent increase in the number of ring- or crescent-shaped burned rock middens at open sites in upland settings has been attributed to an intensification of the use of lechuguilla and sotol. Late Prehistoric burial customs included flexed interments, cremations, secondary disposal in vertical-shaft caves, and cairn burials. The Red Monochrome art style, some examples perhaps depicting bows and arrows, may be linked to this time period. The Infierno phase is defined by stemmed arrow points, end-scrapers, beveled knives, and plain brownware and bone-tempered pottery. Settlements have been recorded only on promontories and are marked by large concentrations of circular stone alignments interpreted as tipi rings. The artifact assemblage is comparable to the Toyah phase of central and southern Texas, and is interpreted as representing an influx of outsiders coinciding with the return of bison during a wetter period known as the Little Ice Age in Protohistoric and early Historic times. Age estimates for the Infierno phase of A.D. 1500-1780 are based on comparisons with other regions, not on radiocarbon dates. 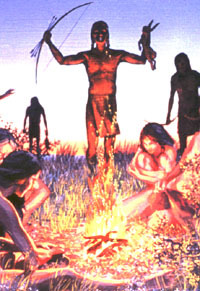 The Infierno phase may represent, as some have argued, a very late, intrusive Protohistoric Plains culture such as that of the Apache or, alternatively, it may simply be a late variant of the Toyah culture in the Lower Pecos region. Historic (500 RCYBP-Present). In 1590, Castaño de Sosa was the first European to traverse the Lower Pecos Canyonlands. Spanish accounts often describe the region as uninhabited; however, illegal slaving expeditions that preceded de Sosa's expedition may have encouraged the Indians to avoid all contact with Europeans. A major factor influencing our understanding of historic native populations of the region is that frequently, the historically documented groups ranged into southern and central Texas as well as the Lower Pecos Canyonlands. Historic Indian groups were widely displaced by the expansion of the Spanish frontier from the south and by intrusions of Apache, Comanche, and their allies from the north and west. European and Anglo-American settlement of the Lower Pecos did not take hold until the mid to late nineteenth century. This Chinese porcelain rice bowl was found in one of the laborer camps along the Southern Pacific railroad within the Lower Pecos region. Chinese laborers were brought from California in the early 1880s to build the railroad that finally connected the west with the eastern portions of the railroad in 1884. An archeological study of one of the railroad worker camps found many artifacts connecting southwest Texas with China. Photo from ANRA-NPS Archives at TARL. 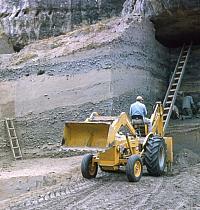 Excavations in progress at Baker Cave, 1984. Photo from TARL archives. 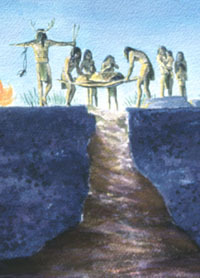 Scene showing an Early Archaic burial ceremony at Seminole Sink as envisioned by artist Nola Davis. Courtesy of the Texas Parks and Wildlife Department. Original on display at Seminole Canyon State Park. Excavations at the back of Hinds Cave. Here archeologists have isolated a block on three sides. The profiles allowed them to see the complex layering and guide their excavations accordingly, layer by layer. Photo by Phil Dering. Burned Montell dart point from Bone Bed 3 at Bonfire Shelter. This bed contained the remains of an estimated 800 buffalo, driven off the cliff above by Late Archaic hunters. Some think these hunters came from outside the region to the north in the southern Plains. The introduction of the bow and arrow into the Lower Pecos Canyonlands is evoked by this mural by artist Nola Davis. Courtesy of the Texas Parks and Wildlife Department. Original on display at Seminole Canyon State Park. The Lower Pecos Canyonlands has an interesting variety of historic archeological sites in addition to its many prehistoric ones. 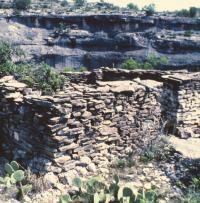 This stone-walled structure was a homesteaders house and is located, like many Indian sites, near a spring within a protected canyon. Photo from ANRA-NPS Archives at TARL.